Beautifully soft and understated, the Riviera rug collection by Nourison offers elegance, high quality and warmth for any space in the home. 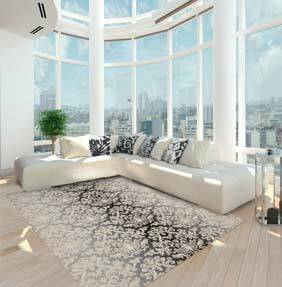 Each rug features a refined design with damask, scrolls and skin designs to choose from. Exquisite detailing is present in them all and every rug has a soft, velvety finish and looks beautiful in any style of home. Each Riviera rug is mad from a combination of premium New Zealand wool and shimmering luxcelle fibres. There are six different sizes to choose from to suit your home.